Oh goodness, what is a better way to be snack-happy in the new year than to ensure you are getting good-for-you snacks delivered right to your door? I mean, seriously, they are all healthy and better-for-you versions of crappy-classics; who doesn’t want or need snacks? You are a liar if you just said yourself – because we all need that thing to get us through the day, and this box can be your answer to having that thing be guaranteed healthy. 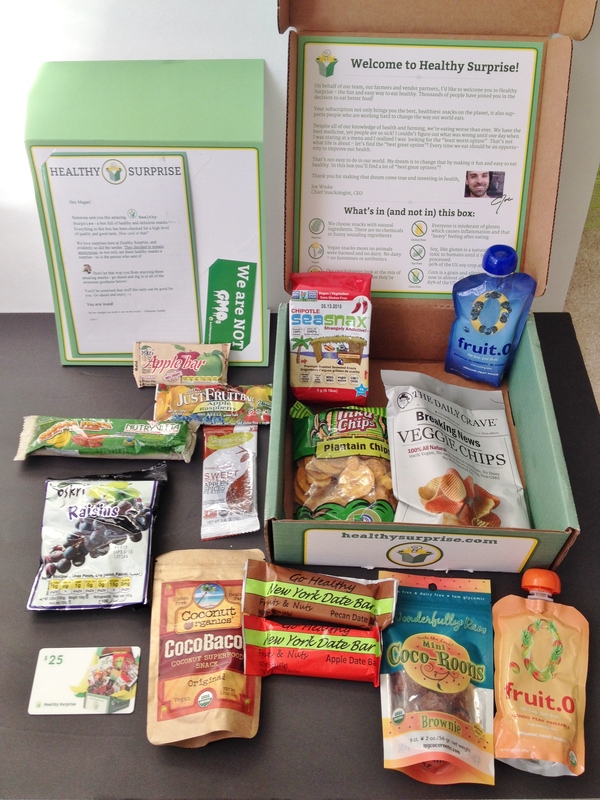 Are you going to let Healthy Surprise Snack Box get you to healthy snacking this year? I don’t know about you but I do love snacking; but I need healthy ones to keep with my new years resolutions! I was fortunate enough to receive this box in the mail to review right before Christmas, and these snacks have been helping me with my resolution of no candy. And wow, it has been hard this resolution – all that leftover candy was brought to work for everyone to chow down on and I have had to use all my self-restraint not to reach for those goodies. In comes the snacks from the snack box. No candy here, oh no. We’ve got other great goodies to consume. More tasteful and all vegan, these snacks sure do help cull the sweet and salt tooth, and give less guilt for sure. Healthy Surprise is a snack lovers dream subscription box like many others out on the market, but these snack are different. 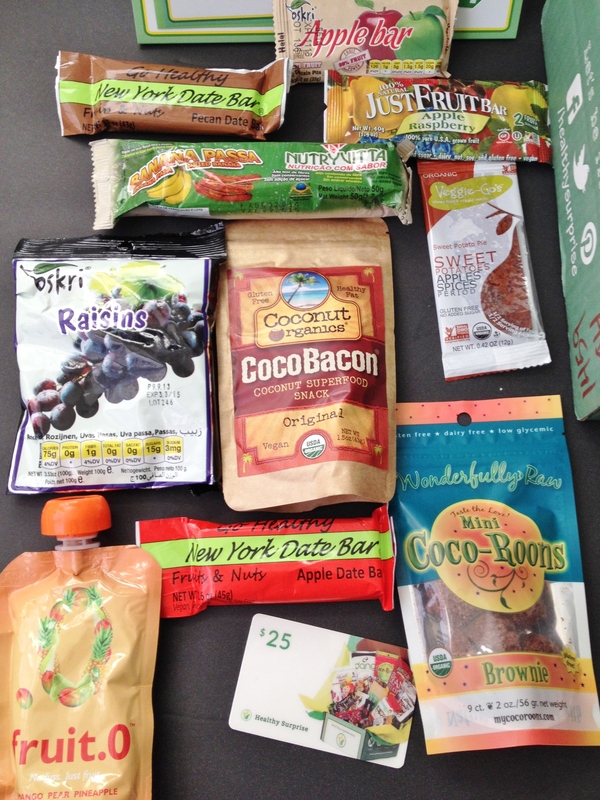 They are all vegan (except the Paleo box), all non-GMO, all gluten-free. These boxes are meant to be used as a guide to healthier snacking, so you don’t need to hit up the store for those other so-processed and no-good foods. There are different types of snack and sizes of boxes you can buy and send as gifts. In for a chocolate box? They have it – and all vegan no less, perfect for Valentines Day. In for just a smaller one-time box? They have it – and by smaller I mean 15 full-size snacks instead of over 20. And yes, I did just say full-size snacks. People, this is what makes this company different than all the other snack box companies – guaranteed full size snacks! You do not get that with other boxes – you may pay a little more for these boxes but I have to say I hate spending $20 for that other box and always just getting sample size snacks! I hate that! It made me angry every time I got that small box. This box? I was shocked to see all those full size goodies! Another awesome thing about this box? You can put your order in and receive it within a few days, instead of only once a month on specific days. You can order a one-time box to see if you like what you get and they have subscription boxes too, for when you decide that yes, you do want all those snacks! I may have gotten this box to review but I am going to be using that $25 gift card (oh yes they do send you a gift card!) to order myself another box. Addicting much? The snacks I loved you ask? The plantain chips, big bag of raisins, and fruit bars. The ones I didn’t like so much? The SeaSnax – it just curled my lip to eat one, the Coco Bacon (I don’t like coconut or bacon) and the Coc0-Roons – again I don’t like coconut, but those Roons were a little too dry for brownie-type things (yes I tried it). I did receive this box to review but, as you know, all opinions are my own. This post has an affiliate link – your purchase through this link helps to keep this site moving and grooving with good-for-you recipes.